The Pontiac Grand Am is a midsize passenger car that originally debuted in 1973. The vehicle has enjoyed three production runs – 1973 to 1975, 1978 to 1980 and 1985 to 2005. The vehicle has since been replaced by the Pontiac G6. Vehicles that directly competed for market share with the Pontiac Grand Am included the Toyota Camry, Honda Accord and Nissan Altima. The 5th and final generation of the Pontiac Grand Am debuted for the 1999 model year. The vehicle shared structural similarities with two other GM vehicles – the Chevrolet Malibu and Oldsmobile Alero. All three vehicles were built on the GM N-body platform. The new design was shorter than the previous model, yet boasted a wider stance. Overall dimensions included a length of 186.3 inches, width of 70.4 inches and height of 55.1 inches. The Grand Am was available as both a 4-door sedan and 2-door coupe. On the interior, the Grand Am was intended to be stylish and ergonomic. Controls and recessed gauges were clustered around the driver. The vehicle accommodated up to five passengers. Front and rear headroom for the 2005 Pontiac Grand Am are 38.3 inches and 37.3 inches, respectively. Total cargo volume is 14.6 cubic feet. The Pontiac Grand Am was available in five trim levels – SE, SE1, SE2, GT and GT1. In mid-2005, all SE models were eliminated to make way for the newly introduced Pontiac G6. The base SE came standard with air conditioning, antilock brakes, stereo system with CD player, power doors and 15-inch wheels. The SE1 added features such as cruise control, power seating, power windows and a folding rear seat. The SE2 also included steering wheel radio controls, upgraded stereo, speed-sensitive power steering and 16-inch wheels. The GT model added a leather-wrapped steering wheel, height-adjustable power driver's seat, power mirrors and rear spoiler. The GT1 rounded out the lineup with 6-way power driver's seat, sunroof and MP3 connectivity. The base engine for the Pontiac Grand Am was originally a 2.4-liter 4-cylinder that delivered 150 horsepower and 155 lb-ft. of torque. This was swapped for a 140-hp 2.2-liter 4-cylinder in 2002. Both base engines were paired with a 5-speed manual or 4-speed automatic transmission. A 3.4-liter V6 engine came standard on the SE2 trim and was optional for the SE1. It boasted 170 horsepower and was only available with a 4-speed automatic. GT models came with an upgraded 3.4-liter V6 that offered 175 horsepower and 205 lb-ft. of torque. This engine was also only available with a 4-speed automatic transmission. 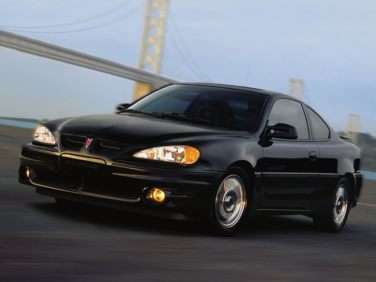 Pontiac included traction control, dual front airbags, daytime running lights and antilock 4-wheel disc brakes among the safety features available on the Grand Am. NHTSA crash tests were a mixed bag for the vehicle. Passenger front impact tests yielded a perfect 5-star rating, A 4-star rating was awarded in the categories of driver front impact, rear passenger side impact and rollover resistance. A lowly 1-star rating was handed down for driver side impact.